Honda CR-V Auto Repair - A+ Japanese Auto Repair, Inc.
A+ Japanese Auto Repair has been servicing and repairing this reliable compact sport utility vehicle since 1997. The Honda CRV has seen many changes over the years. 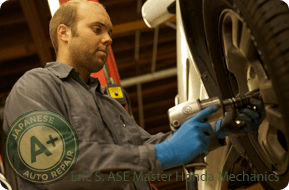 When it comes to repairing the Honda CRV A+ Japanese Auto Repair is known as the Bay Area's Experts. If you have any repair needs contact us or set up an appointmet today. The Honda CR-V is a compact SUV (now called crossover in North America), manufactured since 1995. A+ Japanese Auto Repair has been performing auto repair and service on the Honda CR-V since 1997. The Honda CR-V was loosely derived from the Honda Civic to satisfy a public demand for a sport-utility vehicle from Honda. Introduced in Japan in 1995, the CR-V was Honda's first in-house designed SUV. It was introduced in the United States at the 1996 Chicago Auto Show and went on sale in North America in February, 1997. Many have speculated on the derivation of the CR-V's name; some point out that sales literature in the United Kingdom referred to the CR-V as a Compact Recreation Vehicle or a Comfortable Runabout Vehicle, while others say the name refers to chromium-vanadium, a type of steel used to make tools. Honda refers to the vehicle simply as an SUV. When the original Honda CR-V debuted in the late 1990s, its mission was simple: to offer a distinct alternative to more mainstream mid- and full-size large SUVs. It is one of the best choices available in the all-important areas of being both easy to drive and family-friendly. A common problem with this vehicle is an annoying axle vibration. This is not a safety issue, but changing all of the axles can get expensive, so we recommend that our clients monitor the problem for any abrupt significant change.